FRHA President Michael Ham-Ying presents Carlos Irizarry the 2018 Wendell Rollason Award. 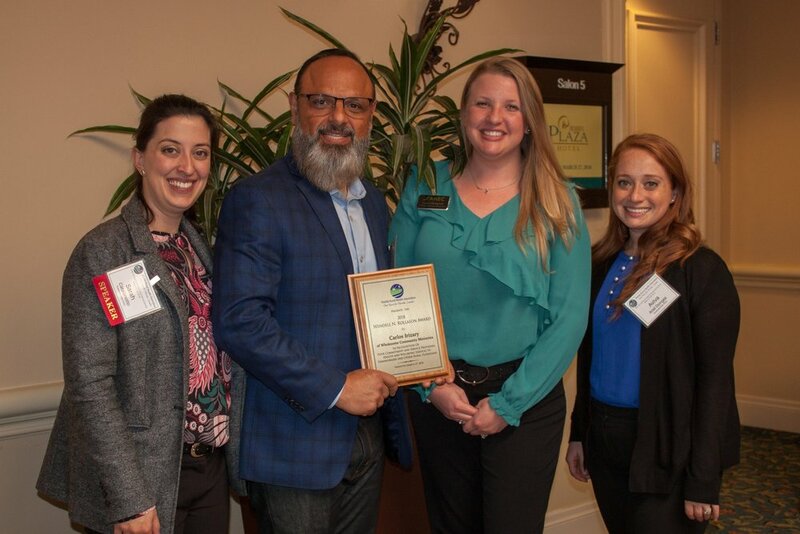 2018 Wendell Rollason Award recipient Pastor Carlos Irizarry of Wholesome Community Ministries poses with Suwannee River AHEC staff Sarah Catalanotto, Laura Hampson and Aviva Ariel-Donges. Representative Cary Pigman (right) poses with Janet DuBois of the Florida Nurse Practitioner Network, who nominated him for the 2017 Wendell Rollason Award. FRHA President Michael Ham-Ying presents Gail Bellamy the 2017 Wendell Rollason Award. Bellamy, of the Florida Blue Center for Rural Health Research and Polcy, is also a longtime FRHA board member. Marty Mielke, chief legislative assistant to Senator Denise Grimsley, accepted the Wendell Rollason Award on behalf of Senator Grimsley during the 2012 FRHA Educational Summit. Mielke is pictured with Austin Curry, executive director of Elder Care Advocacy of Florida, who nominated Grimsley for the award. 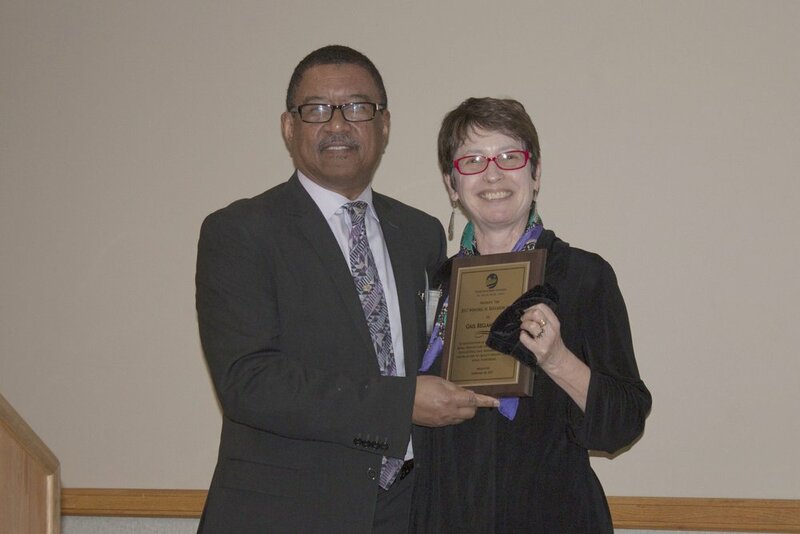 Tirso Moreno, 2015 recipient of the Wendell Rollason Award and co-founder and general coordinator of the Farmworker Association of Florida, with his nominator, Holly Baker, at the FRHA Annual Educational Summit Thursday, Nov. 20. Dr. Mimi Balch, 2013 Wendell Rollason Award recipient, (third from left) poses with her ACORN Clinic coworkers during the FRHA Educational Summit in Gainesville. In 1994, the Florida Rural Health Association Board of Directors established this award to recognize outstanding public service leadership in the area of rural health issues in Florida. The first award was presented to its namesake, Wendell N. Rollason, Executive Vice President of Redlands Christian Migrant Association. With its annual presentation, FRHA will continually honor Wendell Rollason, a powerful force in Florida on issues of Rural Health, migrant farm workers, and education for poor and minority children. He was instrumental in bringing about change through legislative efforts and by encouraging those with differing viewpoints to sit down and talk out solutions. He gave a lifetime of devoted service on behalf of farm workers and rural children and their families. The Wendell N. Rollason Achievement Award will be presented to the individual who has contributed most toward the goals of the Association and who has provided an enduring contribution to rural health care. In the spirit of Wendell Rollason, the individual will be honored for his/her compassion, unselfishness, and commitment in seeking solutions in the delivery of rural health care or quality of life in rural Florida. For more information on Wendell N. Rollason, Founder of RCMA, please go to: http://www.rcma.org. 2000 James T. Howell, M.D., M.P.H. 2004 C. David Smith, M.D.